Wow where does the time go? I hope you all had a great holiday season, filled with lots of love and food. We had a relaxing indulgent one of our own. I’m glad to be back on track and excited for the new year to come. Don’t you think it’s cool that every year we are given time to reflect and plan for a better year or a better us? The funny thing is that we are given that time everyday to reflect and improve. Isn’t life awesome?! I received two great cookbooks for Christmas and look forward to sharing some new recipes. Here’s one I made during the holidays, and I got it from one of the blogs I follow ‘Elana’s Pantry’. It’s fun, unique and of course delicious. Enjoy. 2. Discard soaking water and rinse almonds in a deep bowl of water, repeat until water is clear. 3. Place soaked almonds and 4 cups of water in a vita-mix, or a blender. 4. Blend on highest speed for 90 seconds. 5. Strain milk through a fine mesh paint bag, (I used cheesecloth). Discarding solids. 6. 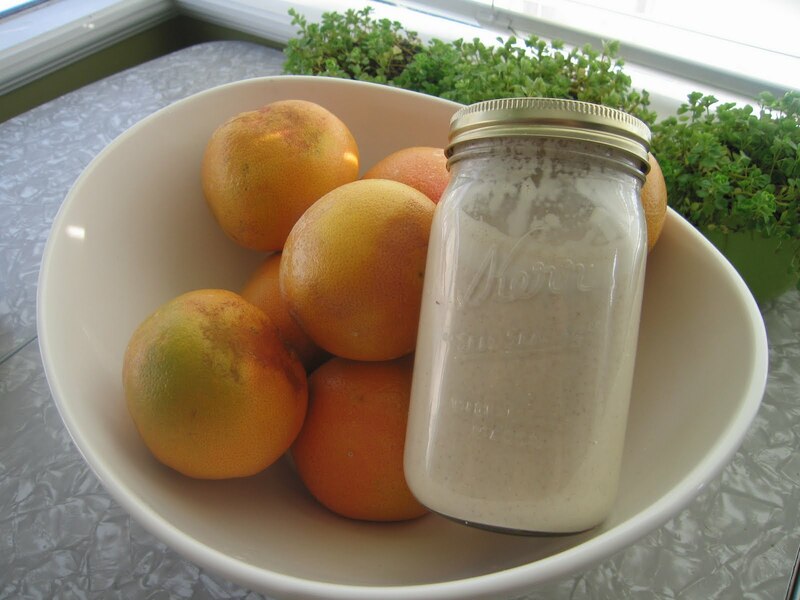 Place almond milk in a half gallon mason jar, add vanilla, agave, yacon, nutmeg, cinnamon and cloves, then shake well. 7. Refrigerate until cold and serve.